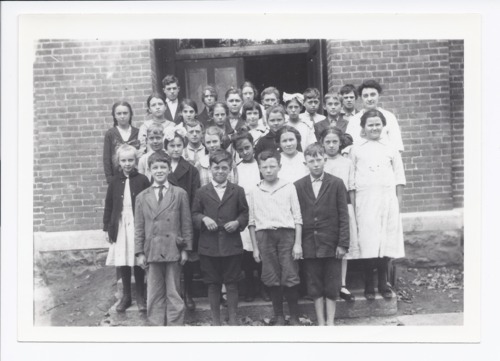 Pictured left to right, top row, are Doughty Strimple, Mildred Gutshall, Unidentified, Bill McGrew, Ralph Hackler, George McGrew, and Miss Cuddy, teacher. Second row: Unidentified, Sarah Strimple, Vida Reser, Clara Wilt, Henry Wade, Ruby Wilt, Unidentified, and Sherwin Griswold. Third row: Allen Enos, Bill Rankin, and Gladys Hopkins. Fourth row: Georgia Stewart, Nora Stamp, Arlene Ward, Evelyn Fritz, Bixby, Olive Meyers, and Fern Lacock. Bottom row: Clyde Cless, Allyn Hartzell, John Lewis, and Harold Marney. This photograph is provided through a pilot project to host unique cultural heritage materials from local libraries on Kansas Memory and was accomplished by mutual agreement between the Northeast Kansas Library System, the Rossville Community Library, and the Kansas Historical Society.